A simple 3v2 drill this week. Two defensemen start at the top of the crease (XD). One forward starts behind the net, one starts on the goal line extended and one in the mid slot. Coach rims a puck in and the three forwards attack the two D tight at the net. 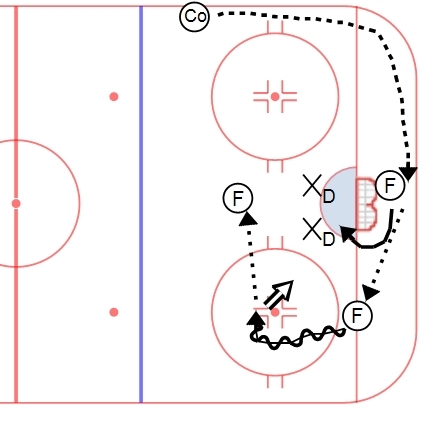 It is intended to be a quick attack drill starting from behind the net. The skills focused on for forwards are playing pucks off the wall, puck protection, quick and decisive puck movement, playing away from the puck, creating passing lanes and angles, getting pucks and bodies to the net. For defensemen, the focus is on great stick position, taking away options, and playing a short ice 3v2. D need to maintain positioning while taking away the most dangerous threat. Typically speaking, the strong side D is going to need to play a 2v1 (with one coming from behind the net) while the weak side D has to maintain position on the slot man.